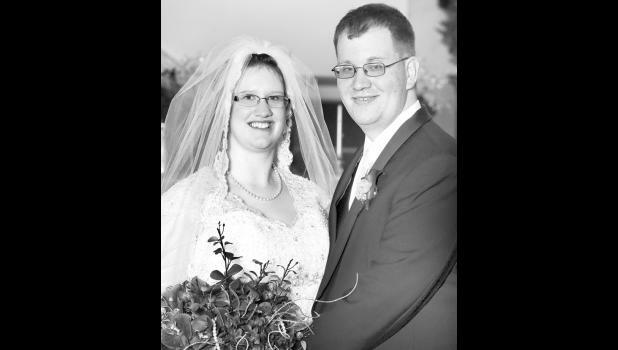 Kendra Leigh McClain and Troy Edward Moppin III were united in marriage at 2 p.m. on Saturday, Nov. 7, 2015, at the Holton First Baptist Church. Pastor Tim O’Byrne officiated. Parents of the bride are Ross and Connie McClain of Holton. Parents of the groom are Troy Jr. and Rose Moppin of Leavenworth. The bride’s dress was ball gown style with sheer long sleeves and a sweetheart neckline and flowing train. It was adorned with floral designs, sequins, beads, sparkles and lace on the bodice and skirt. Buttons lined the back of the dress from the neck to the waist, as well as on the wrists of the sleeves. The bride wore a string of pearls with dangling pearl earrings, as well as sparkling silver wedge shoes topped with faux diamond gems. The bride’s father placed a sixpence in her left shoe, which was given to her by the groom’s mother. The bride’s bouquet contained plum-colored orchids, cascading wisteria, purple roses and lilies and silver extensions. Her grandmother’s pearls were entwined in the bouquet. The groom’s tuxedo consisted of a white shirt with black pants and a black jacket with a plum vest and silver tie. The church sanctuary was decorated with silver fans and plum-colored flowers and tulle and sparkling silver extensions on the pews. Two candelabras stood at the altar, each holding seven plum votive candles and dangling wisteria. Candle lighters were Katy Oxley and Calyssa McClain, second cousins of the bride. A lavender light shone in the sanctuary’s baptismal window framed by plum mums. The unity candle table contained two silver tapers set in silver heart-shaped holders, while a matching holder held the plum unity candle adorned with faux diamonds. Matron of honor was Connie Powls of Holton, friend of the bride. Bridesmaid was Shelly Buser of Horton, cousin of the bride. They both wore mismatched plum-colored dresses with silver shoes and jewelry, and carried small bouquets consisting of plum lilies and silver accessories. They also wore matching silver combs in their hair. Best man was Dewey Stilwell of Leavenworth, friend of the groom. Groomsman was Bob McClain of Wetmore, uncle of the bride. They each wore a white shirt, black pants and shoes, a silver vest and a plum tie with plum boutonnières. Flower girl was Brynn Schmille, friend of the bride, daughter of Ben and Shannon Schmille of Holton. She wore a silver dress with a lace bodice and skirt and a silver flower on the belt, as well as silver shoes and a silver headband with faux diamonds. She threw plum and silver rose petals from a white basket. Ring bearer was Brayden Schmille, friend of the bride, son of Ben and Shannon Schmille of Holton. He wore a white shirt, black pants and shoes and a plum tie with a small plum boutonnière. He carried two rings on a white pillow. Ushers were Scott McClain of Manhattan and Bill McClain of Lyndon, cousins of the bride. A reception took place in the church fellowship hall following the ceremony. Long tables with plum tablecloths held jar centerpieces containing plum and silver gems with silver extensions. A white lattice backdrop sat behind the bridal party table and included bell-shaped lights, plum and white tulle and dangling wisteria. Bride and groom rubber ducks were on the bridal party table along with sprinkled plum and silver petals. A small candelabra holding five plum candles was in between the ducks while two plum tapers were in between the bride’s and groom’s attendants. The square-shaped cake consisted of three tiers and a top piece. It had a white basket weave design and was decorated with plum calla lilies. Topping the cake were two cake toppers, one a silver diamond-studded “M” and the other a small bride and groom antique figurine that has been used on wedding cakes on the bride’s maternal side since 1923. The bride is the fourth generation to use this topper. Punch, mints and Sixlet candies were also served at the reception. The bride is a 2006 graduate of Holton High School. She received certification in business administrative technologies from Washburn Institute of Technology in 2008; an associate’s degree in applied sciences from Allen County Community College and certification as a medical office specialist from Washburn Institute of Technology in 2009; and certification as a legal office professional from Washburn Institute of Technology in 2010. She is employed by The Holton Recorder. The groom is a 2003 graduate of Leavenworth High School. He is employed by the Kansas Department of Corrections. The couple is making their home in Holton.